View of the old docks in Liverpool. These were built after an Act of Parliament was passed in 1710. Daniel Defoe visited it at the early 18th century and commented that the town had a disadvantage of a flat shore, and no key for delivering goods. Consequently 'the inhabitants and merchants have, of late years, made a large basin or wet dock, at the east end of the town'. 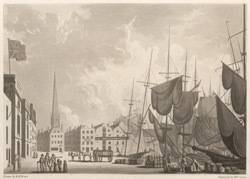 The custom house was at the east end and on the quays are shops, houses and warehouses. A guide of 1810 comments 'many of which have a very old and a very inelegant appearance. In the vicinity of this dock, the streets are in general low and wet, but the rent of the houses high, and they are numerously inhabited'. There was a wet dock - where ships were continuously afloat- and a dry dock-which at low tide drained of water and allowed ships to be accessed easily. Numerous vessels used the old docks such as ships from Ireland, the Mediterranean, West Indies and Africa.